Fruit bouquet crafts are rainy day activities that are good enough to eat. See how easy it is for you and your kids to have fun designing beautiful creations for your table or for gifts. Materials: For containers, you can use just about anything with a wide mouth. That could mean a wicker basket, ceramic vase or plastic tub covered with pretty wrapping paper. For a tropical look, how about a hollowed out melon or coconut? To keep your flowers standing upright you need a soft base where you can insert their stems. Buy some florist foam or make your own lining by chopping off a section of iceberg lettuce big enough to fit the bottom of your container. Speaking of stems, you can make them out of bamboo skewers available at any craft shop. In addition to knives, cookie cutters are a nice touch. They’re very convenient for making all kinds of shapes. Design Options: Encourage your kids to play around with shapes and colors. These are a few ideas to get started. Use cookie cutters to slice a pineapple into a flower, give it a melon ball center and stick it on a skewer. Skewer a row of small fruits like berries or grapes and arrange them in a circle. Dip green apple wedges in lemon juice to prevent browning and cut them with a rippled potato cutter. Line them around the inner rim of the container for a pretty layer of leaves under your flowers. You can also use colored marshmallows or gumdrops for extra pizazz and to hold your fruit in place on the skewer. For extra nutrition, try working in some vegetables like grape tomatoes and broccoli florets. Fruit bouquets brighten up rainy days. Eat your creations on the spot or use them for gifts and party decorations. Glamping is camping for glamorous types. It’s one of those activities to play with guests that lets you all enjoy the great outdoors without shivering in a leaky tent. Get ready to glamp out. Choose your venue: There are plenty of upscale campsites all over the United States and around the world with a wide range of prices. Some have basic pre-pitched tents. Other have facilities so luxurious they’re more like rooms with a view. While rugged camping purists may scoff, most places make an effort to be eco friendly with solar panels and the like. Of course, you can also create a DIY experience in your own backyard. Decide what to bring: Some venues will provide everything from the champagne flutes to the cashmere throws. Others may suggest that you bring your own towels and bed sheets. Whether you travel far or stay at home, a few amenities will enhance the experience. Loll around on deck chairs or fake fur rugs. Decorate with lanterns and tea lights. Hand out boot slippers to get comfortable in. Dine elegantly with silverware, cake stands and tea sets. Party with a cocktail shaker and martini glasses. Coordinate the glamping activities: The priciest destinations may include butler service, but don’t expect Wi-Fi. Depending on your guests, you may lean towards sophisticated or outdoorsy fun. Throw a tea party or play bridge. Take a nature walk or watch birds. Enjoy traditional camping fun like roasting marshmallows and telling stories. Make up your own lyrics to make camp songs sound classier. How about a round of Row, Row, Row Your Yacht or Home on the Range Rover? Above all, take advantage of being offline and have a good old conversation face to face. And enjoy some alone time reading a book or catching up with far away friends with some stationery note writing. Glamping is like Downton Abbey style meets National Geographic Channel adventure. Invite your friends over to share the fun. We are always impressed with our customers creative Valentine ideas for kids. Here are a few ideas using Amy’s Valentine flat cards. These are perfect for kids or adults! It’s O”Fish”al – Package some fish crackers or gummy fish into clear bags and tape onto this card. BEE-U-TEA-FUL – A perfect gift for a teacher, friend, or coworker! Enclose a tea bag with a sugar stick for a sweet treat. 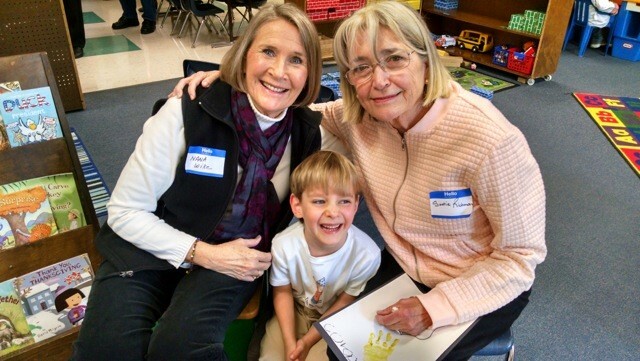 Grandparent’s Day was celebrated at Grace and Corban’s school today! Every year their school sets aside a day to celebrate grandparents and my kids look forward to it each year. My parents live in town and my in-laws live 1 hour away so its so nice that they are able to join in the fun! This year, the grandfathers stayed home so my mother and my mother-in-law had all the fun. They have been good friends since they were in middle school so they walked the halls with their grandchildren in tow this time. Grace showed them her classrooms, her locker and introduced her grandmothers to her teachers and friends. This was Corban’s first experience with all this so yesterday he kept asking who his “grandparents” were. He was unfamiliar with the term because he just knows them as “Sootie and Boom Pa” and “Nana and Grampa”. 🙂 They walked around his preschool classroom looking at this favorite centers and they met his teachers as well. They all came back to the house to tell me all about it! It was a great morning! I’m so thankful for the influence my grandparents had on me and so thrilled to see my children enjoy the same special love that only grandparents can give. Happy Halloween! I loved Halloween as a kid. I remember the excitement of carving the pumpkin, eating a quick dinner and then setting out with my dad in a sweet little costume I was thrilled about! The candy was fine but the excitement of the day and night was way better! Each of my kiddos are in such different stages of kid-hood so it’s fun for me to watch how they each enjoy it differently. Emily (she’s 15) is excited about having some girlfriends over where they’ll huddle over the fire pit, eat smores, drink apple cider, and hang out in her ENO under some twinkle lights that she hung in the trees. 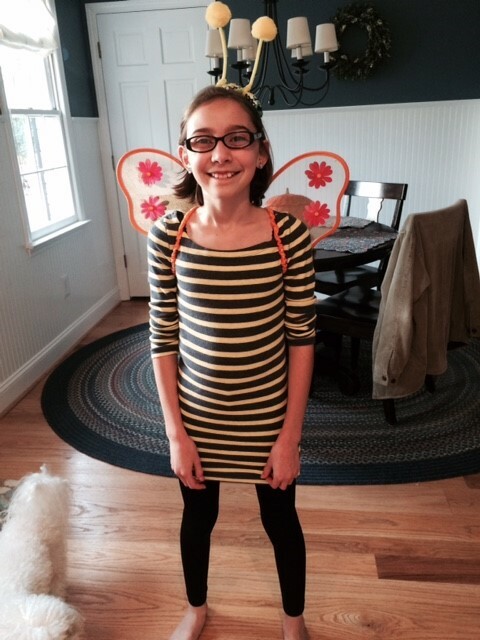 Grace (she’s 11) will go to a girlfriend’s house, trick-or-treat with her and then spend the night. She’s dressing up as a “mature bumble bee” (as she put it). Here’s a pic of her after she figured her costume out a few days ago! I’m a little sad not to have her walk with us through the neighborhood this year but super happy she’ll be with a good friend. Corban is excited and doesn’t even know why! 🙂 He already had a Spiderman mask and t-shirt so I found some pj pants to go with them… therefore, Spiderman he’ll be! He’s just excited about being excited! 🙂 We’ll take him to an outside neighborhood party and then trick-or-treating with him throughout the rest of the neighborhood. Stay safe everyone and enjoy your little ones tonight, no matter their age! Curling up with a good book is a strong temptation in the fall, when the weather turns crisp or autumn rains begin, especially during October’s National Book Month holiday. Celebrate the possibilities open through a love of reading when you choose a book theme for birthdays and other parties. From classics to contemporary, stories come alive with a little creative planning, and it doesn’t have to involve spending a lot of money to incorporate holiday party ideas. Provide book-related party favors to keep the enchantment going long past the last guest’s departure. Set the stage for a book-themed party with invitations made from library checkout cards and book pockets. Type or write the party details on the card, slip it into a pocket and put them into an envelope. Or, to take the theme to another level, glue the sides of a book dust jacket together, add the card and pocket to the inside and address the “envelope” on a bookplate sticker adhered to the outside of the jacket. Stitch two pages of a book together and glue on a ribbon handle to make goody bags that you fill with bookmarks, playtime eyeglasses and maybe a copy of a paperback book, as well. Make garlands from book covers or pages to decorate the party room or place framed book pages around the table and on other surfaces. Take some ideas from the books themselves when selecting foods. For example, display Dr. Seuss’s “One Fish, Two Fish,” and serve goldfish crackers or fish-design cupcakes or cookies. Add a storybook-shaped cake to the menu, along with food-dyed “Green Eggs and Ham.” Chocolate chip cookies fit with “When You Give a Mouse a Cookie,” and many other books present ideas for food and drinks that pertain to those stories. Gummy worms and apples also make great book-related treats. Well-loved classics offer a variety of possibilities for your party. Hold a silly tea party with an “Alice in Wonderland” theme by labeling foods with “eat me” or “drink me” tags, use mismatched tableware and make cakes, cookies and other confections in unusual sizes. Or throw some pillows around on the floor and enact “One Thousand and One Nights” by encouraging guests to share stories. For adults, recreate “The Great Gatsby” with 1920s clothing and great jazz music. Use cookbooks related to the story to share the four-course afternoon tea from “Anne of Green Gables,” serving sandwiches, raspberry cordial and other treats. Invite guests to the “Little House in the Big Woods” or “Little House on the Prairie” for a celebration of historical fiction. Encourage guests to dress for the occasion in pioneer-style clothing, and add some of the foods in the books to your menu. Combine history and gardening with a “Secret Garden” party that includes glittered keys to open the garden’s gate for bird-, flower- and butterfly-shaped cookies and treats. Let guests “chaaaarge it” with make-believe key cards when you turn “Eloise at the Plaza” into an entertaining theme, with guests playing dress-up and munching on Eggs Eloise omelets, Teeny Weenies, and Skipperdee sandwiches, named in honor of Eloise’s pets. “Charlotte’s Web” combines fantasy with classic literature. Serve up a pig-shaped cake, along with popcorn and farm-fresh produce, before letting guests decorate their own pumpkin with markers and stickers. Send guests on a Percy Jackson-themed treasure hunt, complete with clues that refer to mythology and to events in the book. Animal books like “Brown Bear, Brown Bear” and “Curious George” give you lots of ways to bring the books to life at your party, while “Horton Hears a Who” gives you the perfect excuse to serve cake pops as the featured refreshments. Let guests make their own masks, crowns and wands before dancing the wild rumpus dance from “Where the Wild Things Are.” Contact us for more holiday party themes and tips.